I bought two coconut sticks when I was pregnant. I used it on my belly and now use it on my daughter. She has VERY sensitive dry skin. Her scalp was also very dry and irritated. As soon as I apply the coconut stick it is gone within hours. I now put it on her from to toe and I don't know what I would do without this product!!!! I've bought 7 coconut sticks so far and absolutely love them. I have eczema and have a hard time getting excited about putting on store-bought greasy lotion. 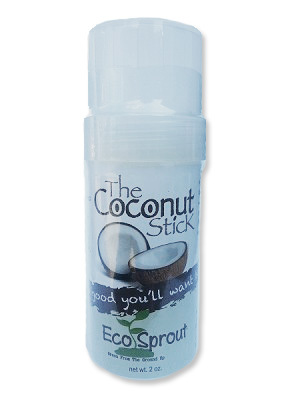 The coconut stick is soo easy to use and I love that it contains all-natural ingredients. My 4 year old daughter loves it - not only because it doesn't go on COLD like other lotions, but because it's fun and easy to use! I used to put coconut oil in a reusable container, but then it will melt all over my diaper bag. This is the best thing since sliced bread. Seriously. We use these sticks for diaper rash (or, rather, keeping diaper rash at bay). Between the Coconut Stick and the EcoSprout laundry detergent, my baby's bum is clean and happy...and not red, for once! The stick was working great for mosquito bites and dry itchy skin on my boys. But when our home reached 78 degrees inside it melted all over the table. Disappointed as it said it won't melt until it reaches over 100 degrees. I've contacted customer service, will update when they respond!